Being the ultimate destination packed with beauty, adventure, varied landforms, bright sun, sunny skies, blue waters, white beaches and stunning unmatched flora and fauna, Andamans is the place to be for an ideal vacation. The brilliant conglomeration of 572 islands comprising Andaman and Nicobar Islands attracts tourists form far and near. With such bounty of nature and abundance of sea, sand and sun there is no dearth of activities and options in Andamans. The relaxing beach sojourns, the adrenalin-packed water adventure activities, the fun sea activities, the mud volcanoes and limestone cave explorations, the out-of-the-world sightseeing marvels can leave even the most curious minds and nature lovers completely satisfied and overwhelmed. There is nothing better than to spread out in the sandy sun beside the blue heavenly seas and lapping waves with a book and a can of chilled beer. Tourists who are in search of relaxation and peace find no activity better than lazing around sun bathing and sea soaking. Lie down in the soft sands along the sunny Andaman beaches to read and catch with your favourite books or sleep, sipping some fresh green coconut water. Hang and swing in the hammock in the most secluded and beautiful of spots and lie still for hours with your eyes closed and senses all alert taking in the coolness of sea breeze and the salty smell of sea. You can also give your reading spree a boost with a book while on hammock. The North Bay Beach and the Elephant Beach are famous for the snorkelling activity, which forms one of the primary attractions of Andaman and Nicobar visit. The seas are known for the exquisite coral reefs that are often described as world’s third best and offer spectacular coral watch and lively, colourful and beautiful sea-water creatures viewing. Thus snorkelling tops the chart of to-do list in Andamans. Out of the two destinations earmarked for snorkelling, Havelock is a better option as the water life is more diverse there compared to North bay and the waters more clearer that offer better views of the scenic beauty around. If you are eager to watch a million stars in the dark sea water of Andamans, we would suggest night kayaking that offers the unique experience of watching the rare and stunning phenomenon of bioluminescence. The tiny speckled stars and galaxies twinkle and shine under your feet as well as overhead. Away from the shores of Havelock Island as the water glows like a million fireflies, you get transported to a fanciful world. This unique phenomenon occurs on account of the presence of phytoplankton in the water that is a speciality of this locality. Tanaz, a lady expert in kayaking and an encyclopaedia of star gazing, organises night kayaking trips under blinding darkness where you hear only the splash of the oars striking the sea surface, the occasional splish-splash of the sea creatures disturbed by the oars. Bioluminescence is best observed on new moon nights. Dolphin Ride is similar to glass-bottom boat ride where the bottom of the boat is fitted with a giant tough glass for you to see the underwater marine life as the boat glides through the coral reefs slowly and steadily. The Boat is named Dolphin and is a speed boat made with Russian technology. The climax of the tour is reached when you are given a short speed ride after the coral watch. Per person cost would be around 1800 for a single ride for about half an hour. It is recommended only for those who have not been able to go for a snorkelling or scuba diving. Sea walking is fun where you walk at the bed of the sea and watch the marine life from close quarters and feel the thrill and excitement. A brief instruction phase precedes the sea walking adventure. North Bay Island and Havelock Island are the two primary destinations for sea walking. Scuba diving is a beautiful water sport activity that mesmerizes you with the unfolding of the dark deep mysteries of the underwater world. As you dive through the coral reefs you get awed at the diversity of plants and animals and the colourful topography all around you. 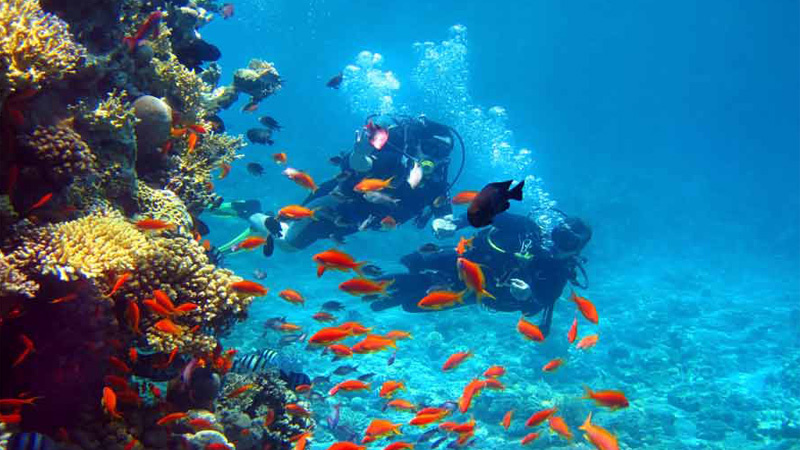 You can scuba even if you don’t know swimming, which is a big advantage and allows more precipitation. It is an activity for the young and old alike. Glass-bottom boat ride is there for those who refrain from scuba diving or snorkelling or sea walking due to various physical discomfort or medical reasons. You can get limited glimpses of the water world underneath you through the crystal clear waters from the comfort of glass-bottom boat. These rides happen in the Water Sports Complex and North Bay Coral Island. It is also a popular sport in the area between Port Blair and Jolly Buoy Island. The rates start from INR 500 per person per ride. For all the lovers of sea swimming, Andamans is a great destination. The beautiful landscape and the beauty of the blue waters add to the charm of swimming. The isolated and secluded beaches and islands leave you at your private world where you can swim for hours on end. Explore the far-flung island and the secluded beauty of the beautiful islands such as South Rutland, Cinque Island and other island adjoining in and around Little Andamans with exclusive surfing trips taking in the swell of the sea and the swirl of the air. Jet ski ride, water scooter or sofa ride at Port Blair is fun and thrilling. The most popular of beaches that are easily accessible hustle and bustle with these sports activities. Andaman Water Sports Complex or Rajiv Gandhi Water Sports Complex is a trusted place providing these facilities. Riding a precarious banana boat as you are being tugged at full speed by a power jet boat is fun and not for the faint hearted. At any single point in time, six people can clamber onto a banana boat. With life jackets being mandatory for the riders, this sport is perfectly safe. As the speedboat gains speed the banana boat lurches forward and it is a challenge to keep balance and not to fall off. This sport is tremendously thrilling and the ultimate thrill comes when some speedboat drivers decide to plunge the riders deliberately by swerving the boat in such a manner that the riders topple into the sea water. For each rider the cost would be INR 620, which includes a banana boat, life jacket and instructor. A unique, though a bit expensive, indulgence would be seaplane adventure in the Andamans. Pawan Hans runs seaplane adventures from Port Blair to Havelock and carries nine passengers at a time in one trip. The time of flight would be 15 minutes. The same distance when traversed by water in a ferry takes around 2 hours. One-way flight costs INR 2000 per person. For the more adventurous ones, give a boost to your adrenaline flow with a wild parasailing. A sport that gives you the best of both air and water, parasailing is fun. A parachute is harnessed and pulled by a motorboat where you hang from air at a certain height and you tag on to the speedy boat with the air rush. To satiate your adrenaline rush try parasailing. You fly in a harness. Avail this facility while you are in Portblair. The Andaman Water Sports Complex offers this sport indulgence. It is an adventure but within safe confinements under secure supervision. You can keep the others and children accompanying you who would not be interested in parasailing in some other activities that happen here such as paragliding, kayaking and canoeing. Havelock also is known for parasailing. Paragliding is also offered in the Andaman Water Sports Complex that provides facilities for parasailing, jet skiing, canoeing, kayaking and parasailing. Paragliding in the Andaman skies with a view for the magnificent islands and startlingly blue seas all around, the jungle green of the mangroves and the strong and pleasant air current that blows across your face is super thrilling and rejuvenating. A glide across the mud volcanoes and the beautifully connected Cinque Islands has been described as wondrous by paragliders. Every angler dreams of bringing his/her fishing fantasy to a crescendo with game fishing in Andamans. There are dedicated agencies that provide personalized services and have been operating as fishing facilitators for about a decade. There are tailor-made fishing trip arrangements where the anglers might get overboard with his prized catch such as a mammoth dogtooth tuna or huge trevally. Specialized services keep in mind all the techniques such as jigging, popping and trolling are practiced and several fishing hotspots have been earmarked to provide the ultimate experience. Fishing is still a niche sports in Andamans and have not been commercially exploited too aggressively. Mass tourism hasn’t been channelized as yet for this particular sport. The archipelago of Andaman and Nicobar Islands is isolated and distanced from all major land masses such as the Indian subcontinent or the Thailand which are the closest but still 2000 kilometre and 750 kilometres away, respectively. As a result the eco-marine system has been preserved and not been commercialized. Some of the islands are populated by the aboriginal tribes such as Great Andamanese, Sentinelese, Jarawa, Onge, Shompens and Jangil who do not have much contact with the rest of the worlds and preserved their identity for centuries in their seclusion. These factors make game fishing even more alluring for common fishing lovers among adventure-hungry tourists. Every angler’s experience in these untrodden waters is bound to be unique.